On 20th of October is World Osteoporosis Day! 1996 the World Osteoporosis Day launched for it’s first time and in 1998 and 1999, the World Health Organization acted as co-sponsor of World Osteoporosis Day. The day also marks the launch of a year-long campaign to raise awareness of osteoporosis and metabolic bone disease. Since 1999 these campaigns have featured a specific theme. World Osteoporosis Day (WOD) takes place every year on October 20, launching a year-long campaign dedicated to raising global awareness of the prevention, diagnosis and treatment of osteoporosis and metabolic bone disease. 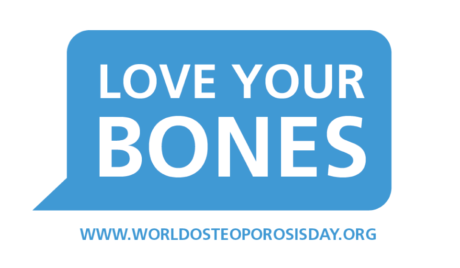 This years theme is Love Your Bones – Protect Your Future. Organized by the International Osteoporosis Foundation (IOF) every year, World Osteoporosis Day involves campaigns by national osteoporosis patient societies from around the world with activities in over 90 countries.